A pretty, soft coloured bracelet - perhaps for Valentine's Day? or just nice as a gift. 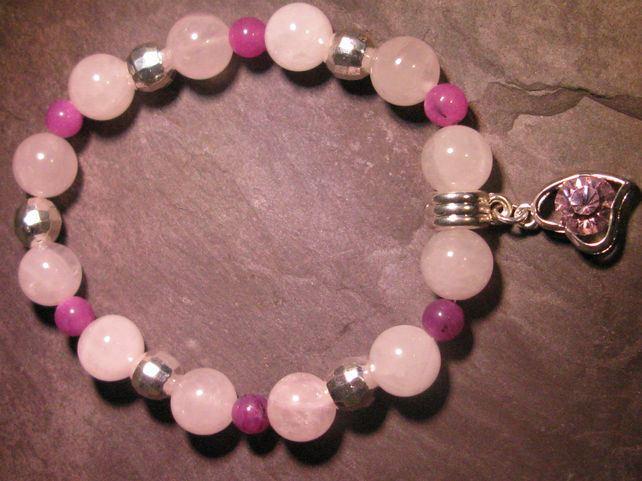 Rose Quartz is thought to be the gemstone of communciation and love. Tibetan silver facetted spacer beads, and a heart drop charm. Lots of people believe in the power of gemstones, and they can act as a kind of tactile focus point, so this combination is especially nice for Valentine's Day! Folksy :: Buy "Valentines Hearts Desire Bracelet"